Happy Equinox! Spoon Knife 3: Incursions is OUT in all senses of the word! I am a pile of melted squee to find myself listed along with these incredible authors. This volume contains my short story “Heat Seeking Entities,” which is set in the same universe as Hoshi and the Red City Circuit only a few decades before Integration Law passes, and on a much colder world. SPOON KNIFE 3: INCURSIONS is now available from Autonomous Press. 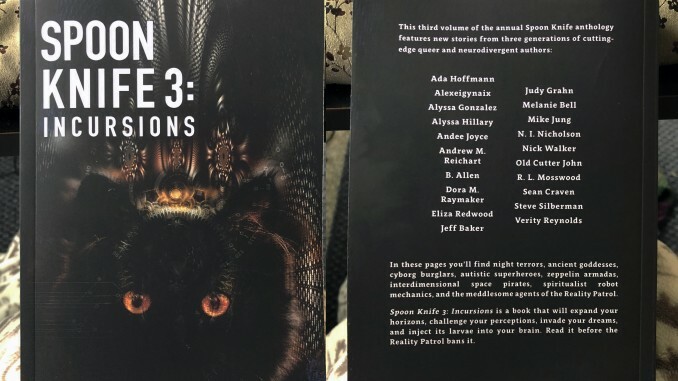 The third volume of the annual Spoon Knife anthology features original stories from Judy Grahn, Steve Silberman, Mike Jung, Dora M. Raymaker, Sean Craven, Verity Reynolds, Ada Hoffmann, Andrew M. Reichart, Alyssa Gonzalez, Andee Joyce, N.I. Nicholson, Alyssa Hillary, Jeff Baker, Alexeigyniax, R.L. Mosswood, B. Allen, Eliza Redwood, Old Cutter John, Melanie Bell, and Nick Walker. Genres range from memoir to wild speculative fiction. Order direct from Autonomous Press – order the paperback direct from Autonomous Press and get the ebook version for free. Or ask your local bookstore to order it and carry it!